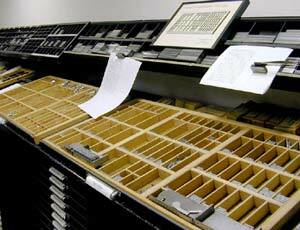 The production of a fine press book usually begins with lead type. This picture shows the type drawers at Havilah being layed out with Centaur type which was acquired from Mackenzie and Harris, a typefoundry still operating in San Francisco. Each small compartment contains the 'sorts' of all the different characters needed for setting type. Once the cases of type are laid out and a few other key decisions are made, we begin setting type. This is done letter by letter, line by line, justifying each line by adding thin spaces of lead, copper, and brass. It requires a bit of concentration: the type is set backwards and upside-down. When all the type has been set, proofed, and approved, we are ready to begin printing. 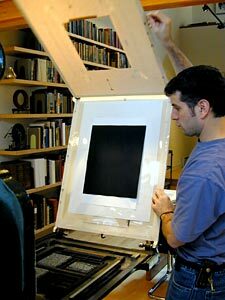 Here is pressman Chad Johnson hanging a sheet of black Fabriano Ingres onto the tympan in preparation to print. The text, separated now into page spreads, is visible on the press bed in the lower left of the picture. 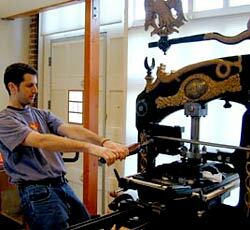 One of several well-maintained and amazing presses at Havilah, this Columbian from 1869 creates wonderful impressions. The tympan (and paper) has been laid over the type and rolled below the platen. 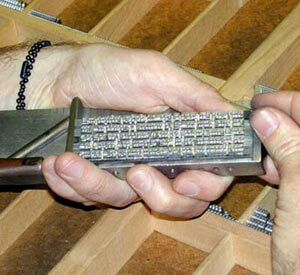 When the bar is pulled, the platen is lowered onto the type and the impression is made. Once all the printing is done, it is on to the binding step. After the pages have been pressed, dried, & folded, they are trimmed to size. 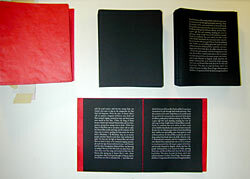 This picture shows the two 'signatures' which make up the book as well as the endsheets into which they are sewn. Due to the small size of the textblock, we kept our binding design minimal. When everything is trimmed and in place, the books are sewn together before being adhered into their hard covers. 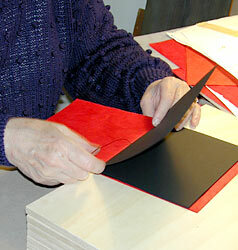 Here, Barbara Voltmer sews a signature into the pair of scarlet endpapers that hold the text in place. We chose black thread to keep a color theme and prevent the sewing from interfering with the text. We wanted this book to harken back to older books which were bound in a spirit of the renaissance or the humanistic texts of early printed material. 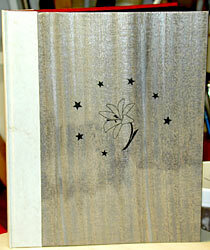 To that end, we plan to line all the outer boards with a wood veneer which we've stained silver with pigment. 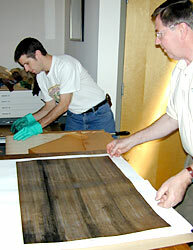 This photo shows Fred Voltmer and Chad Johnson in the process of staining the sheets of veneer. Once finished, the book will have a paper vellum spine, stained veneer boards - the front of which will be stamped with a logo of the flag of Terre d'Ange, and the sewn text block with scarlet endpapers fixed inside. A sketch of the final result, this photo gives the basic idea of what we are working towards.